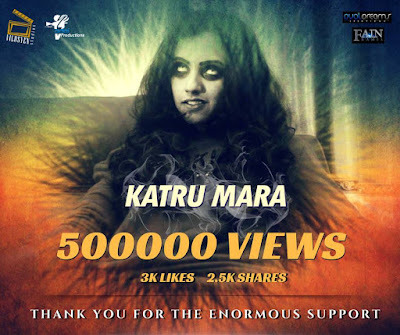 Boggler Blogger: Katru Mara: Changing the face of short film? Being a movie buff, I enjoy watching all kinds of films, no matter the genre. Actually not all, because horror films are a big no no for me. Well that isn’t the point here anyway. As I said I enjoy watching all kinds of films, including short films. Not too long ago I came across a Tamil short film called “Katru Mara”and watched it. The tittle actually means learn to forget. It was indeed a unique tittle and the film wass directed by “Venpa” famed Yuvaraj Krishnasamy in which he also stars in alongside Madana Vilosyen, Yogeswari Murugan & Arun Kumar Vengadasalam. 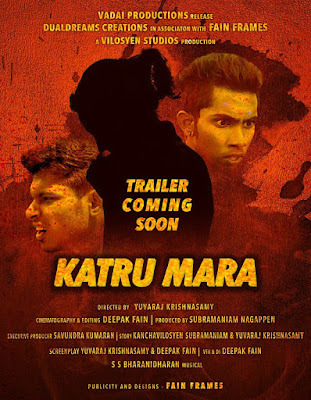 “Katru Mara” touched about a story of a young student who enrolls to a college and how his life takes a dark turn when he mingles with the wrong company. Yes many short films or even feature films may have shown this storyline but trust me “Katru Mara” has its own unique touch which you may have never seen before. The biggest stand out point of the film is its screenplay and all credits goes to Yuvaraj Krishnasamy & Deepak Fain. The way the sequence of scenes are arranged and shown to you will keep you guessing and you won’t be able to predict the end of the film even after having watched most of it. Madana Vilosyen deserves huge credit for this film. His appearance may not tick all the box of what a lead character is stereotyped to be, but he goes on to show that if you have the talent you can be a terrific actor. The way he plays with the expressions on his face and with his body language as his characters grows and transforms should be lauded. Despite limited screen time on what is a very strong subject, Arun Kumar’s candid performance evokes laughter in the film. His character brings you a little humor relieve when the film is traveling on a serious and strong pace. Yogeswari Murugan steals the show towards the end of the film. She plays a pivotal and very strong character in this film and the way she dominates the screen towards the climax was outstanding indeed. Saving the best for the last, if this short film is to be a success then most credit goes to the man Yuvaraj Krishnasamy. I’ve spoken about his qualities in terms of the screen play arrangement and now it is about him as an actor. Yuvaraj, who played a love hero character in “Venpa” shades off that lover boy character and plays a dark role in “Katru Mara”. It is great to know the industry is starting to have more talented actors who are not afraid to do different shades of character. As a director he did an amazing job to get the best performances from his cast. Remember the name, this boy is going to make it big! As you watch “Katru Mara”, you will realize that it has a very strong and some might even say gory content. Huge credit to the team for coming up with a fresh script and I praise their bravery for pushing the script to new boundaries by basing it on such a sensitive subject. This is why I believe “Katru Mara” is going to change the face of short films. Instead of picking a common path of doing a love themed film or commercial film, the team went on with picking a very strong subject and plot. I hope in the future more short film directors would follow in this path and soon enough see it translated into feature films. The film carries a wonderful message about youngsters in university and how their actions can affect the lives of everyone around them and I am sure once you watch it, the film will make a lasting impression on you.